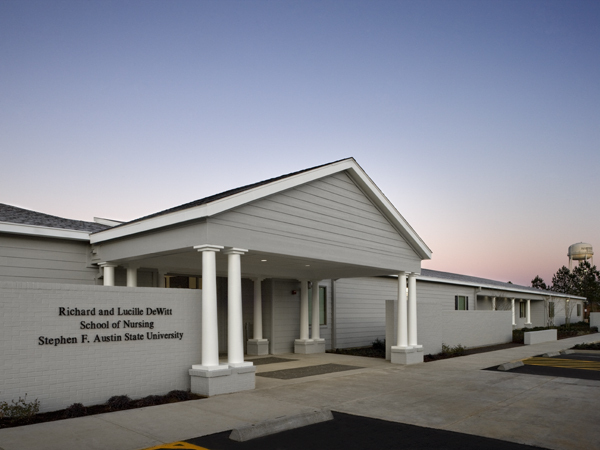 The one-story, 42,000 sf wood frame DeWitt School of Nursing building allowed Stephen F. Austin State University (SFASU) to expand its School of Nursing through the creation of a state of the art teaching facility. The 9,000 sf simulation laboratory includes four different spaces which replicate the clinical environment with 14 patient rooms and a total capacity of 21 patient simulators. Areas include a 10-exam table assessment lab, a skills/ER/debriefing lab, a 10-room critical care medical/surgical lab and 5 room obstetrics/labor and delivery/NICU and pediatrics lab. Nurses stations allow simulated patient monitoring through the use of an active nurse call system tied to each mock patient room. Each room is equipped with typical patient room furniture and an active headwall with air, vacuum and physiological monitors. Glass walls across the front of rooms enable students to observe procedures. 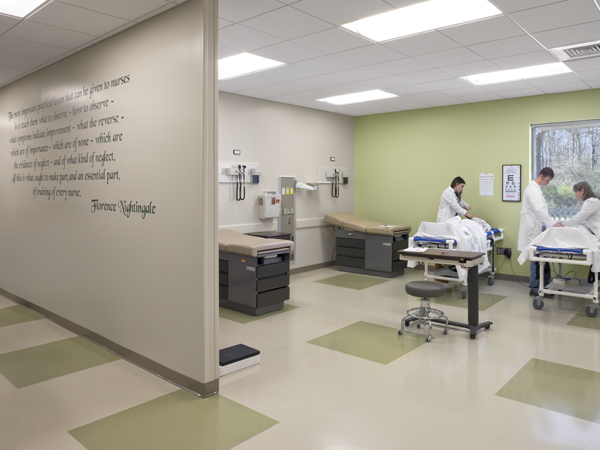 The emergency room lab was designed for multiple uses, including emergency simulation with ambulance bay, debriefing space for student feedback, and continuing education for community health professionals. The lab has collapsible stretchers instead of beds for easy storage and flexibility of space.